With its views of the Tower Of London and The Shard, Tower Bridge offers one of the best vantage points in the city from its spectacular glass walkways, elevated 140ft above the Thames. The East Walkway boasts fantastic views of the Docklands and the elegant Canary Wharf, while from the West Walkway you can compare the mixed architectural styles of City Hall, the Tower Of London, St Paul's Cathedral, the City, Big Ben and the London Eye. Now galleried and with glass underfoot, these walkways were originally built to transport pedestrians across the Thames when the bridge was being lifted to let tall ships sail past. Today you can walk on the spectacular glass floor 42 metres above the river and if you time it right you can see the bascules being raised beneath your feet. Entering via the North Tower, visitors are whisked smoothly and seamlessly by lift to the top (47 metres above the Thames) where they have a unique opportunity to see the Bridges spectacular steel skeleton from within. A series of short films document the fascinating history of the Bridge, while interactive computerised kiosks and graphic panels explain the significance of the incredible views. Each tour ends with a dramatic descent into the historical Victorian Engine Rooms. Installed for the completion of the bridge in 1894, these huge and beautifully maintained, coal-driven engines were used to power the thousands of bridge lifts. Experiment with models demonstrating the technology behind the Bridge, while viewing an intriguing collection of photographs charting the life story of this world famous construction, before being taken smoothly back down to solid ground. Tickets for the exhibition can be purchased here. Elevated glass walkways over city waterways, vantage points and engines. 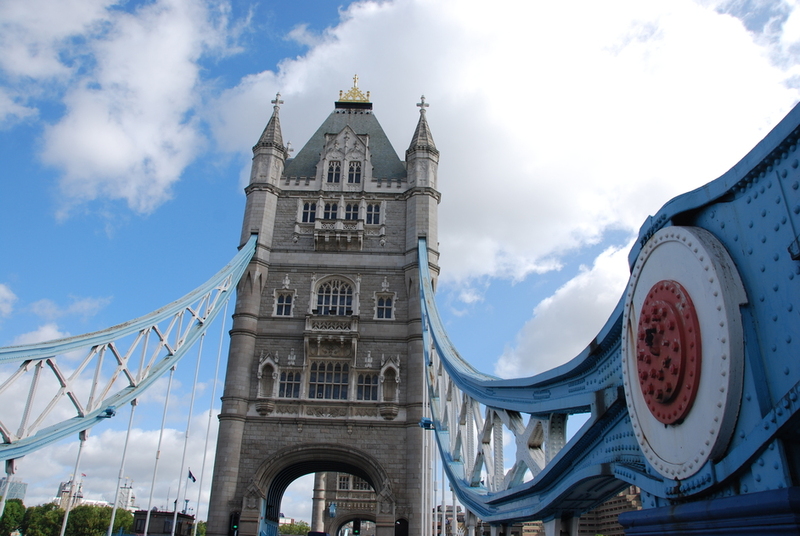 What are the best dining options near Tower Bridge London? Tower Bridge gyms, sporting activities, health & beauty and fitness. The best pubs near London Tower Bridge. Tower Bridge clubs, bars, cabaret nights, casinos and interesting nightlife. Where to have your meeting, conference, exhibition, private dining or training course near Tower Bridge. From cheap budget accommodation to luxury 5 star suites see our special offers for Tower Bridge hotels, including The Tower Hotel from 86% off.